This easy recipe for Cheesy Scalloped Potatoes Gratin, or Au Gratin potatoes is a delicious side your family will love! Easily turn it into a main course by adding ham or bacon. I don’t know about you but I haven’t found a potato recipe I haven’t liked. Potatoes = comfort food in my book! One of my favorite potato recipes is this one for Cheesy Scalloped Potatoes Gratin. 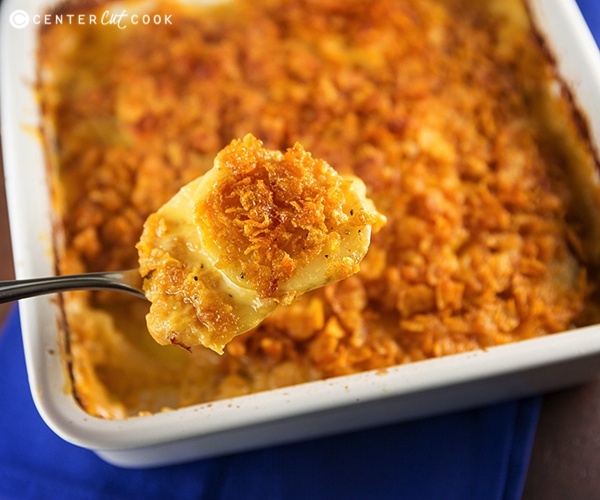 It is cheesy, comforting and makes my belly happy! The best part? The crunchy cornflake topping! You could add ham or bacon and make this an easy full meal. 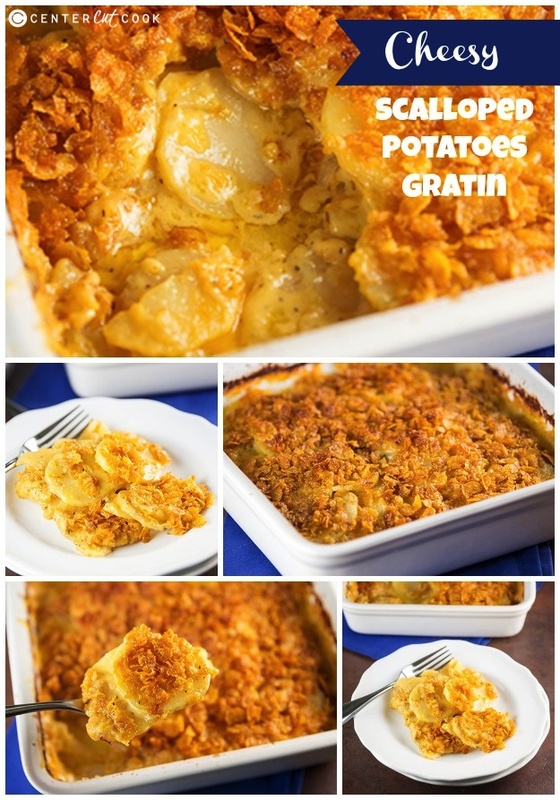 Have you ever wondered what the difference is between scalloped potatoes and au gratin potatoes? And what does gratin mean? I’ve got answers, my friend. Technically, this recipe that I am sharing with you today is au gratin potatoes because au gratin is with cheese. Scalloped potatoes is typically just a cream sauce. I’ve always called it scalloped potatoes, however, so I decided to stick with the name, even though it isn’t technically correct. And as for gratin? Gratin is when there’s a crunchy crust of breadcrumbs, cheese, or in this cake, cornflakes. 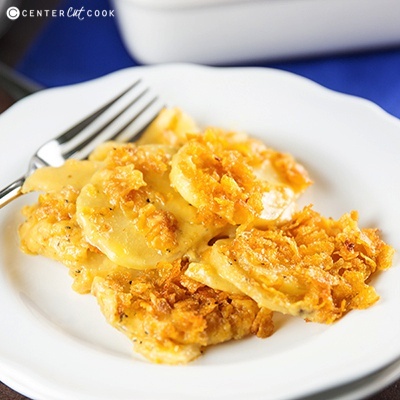 To make these scalloped potatoes, you will need to slice the potatoes so that they are 1/4 inch thick. The thickness is important here so that they evenly cook. If you cut them by hand, and your slices are thicker than 1/4 inch, they aren’t going to cook all the way through in the recommended baking time. I used my food processor for this to help ensure even slices. You could also use a mandoline. With only 20 minutes of prep time, this Cheesy Scalloped Potatoes Gratin recipe is actually pretty simple to make and works beautifully as a side dish, or as mentioned, add in a little ham and you’ve got a full meal. Enjoy! *Tip – when slicing your potatoes, make sure they are all 1/4 inch thick slices. If they are thicker, the potatoes will not cook through. I used my food processor for this, you could also use a mandoline. Spray a 1 quart casserole dish with non-stick cooking spray. In a saucepan melt 3 tablespoons butter over medium heat. Whisk in flour and continuing whisking, allowing the flour/butter (roux) to cook for a minute or two. Slowly add in the milk, continuing to whisk to remove any clumps. When the mixture has thickened, add in the cheese and stir until the cheese has melted. Season the cheese sauce with 3/4 teaspoon salt and 1/2 teaspoon black pepper. Layer the potato slices in the casserole dish. Pour the cheese mixture over the top. Cover and bake for one hour and 10 minutes. In a small bowl combine 1 cup crushed corn flakes with 6 tablespoons melted butter. Remove the potatoes from the oven. Sprinkle the cornflake mixture over the potatoes. Return the potatoes back to the oven and continue cooking for 20 minutes, or until the topping is nice and crunchy and the potatoes are fork tender.